damaue => damause, eisoraie => eisoraise etc. It is imperative that you read the three notes at the end of the table above; otherwise, you will not understand why ancient Greek resorted to future infinitives when it was strictly called for. Since ancient Greek is the mother of all modern Centum (Occidental) languages, it contains every possible variant in conjugations and declensions to be found in the latter, except that modern Occidental languages never contain all of the elements of ancient Greek grammar. The lack of a future infinitive in modern Centum languages (at least as far as I know) bears testimony to the fact that ancient Greek contains more grammatical elements than any modern language. Each modern language borrows some, but never all, grammatical elements from ancient Greek. The upshot is that ancient Greek grammar is significantly more complex than ancient Latin and all modern Occidental languages. This will become painfully obvious as we progress through each grammatical element, one after another in ancient Greek, including Mycenaean. For instance, the next grammatical form we shall be addressing is the aorist or simple past infinitive, another one which does not appear in any modern Western language. Just added to academia.edu: A Significant Breakthrough in the Decipherment of Linear B: The Rôle of Supersyllabograms in Mycenaean Linear B, Presentation by Richard Vallance Janke at the Pultusk Academy of the Humanities, Pultusk, Poland, July 1, 2015. 139. Vallance Janke, Richard. “An Archaeologist’s translation of Pylos Tablet TA 641-1952 (Ventris), with an introduction to supersyllabograms in the vessels & pottery Sector in Mycenaean Linear B”, TBP in Archaeology and Science = Arheoologija I Prirodne Nauke (Belgrade) ISSN 1452-7448, February 2016. approx. 30 pp. In partnership with The Association of Historical Studies, Koryvantes (Athens), our organization, Linear B, Knossos & Mycenae (WordPress), conducts ongoing research into Mycenaean archaeology and military affairs and the Mycenaean Greek dialect. This study centres on a  fresh new decipherment of Pylos tablet TA 641-1952 (Ventris) by Mrs. Rita Roberts from Crete, who brings to bear the unique perspectives of an archaeologist on her translation, in all probability the most accurate realized to date. 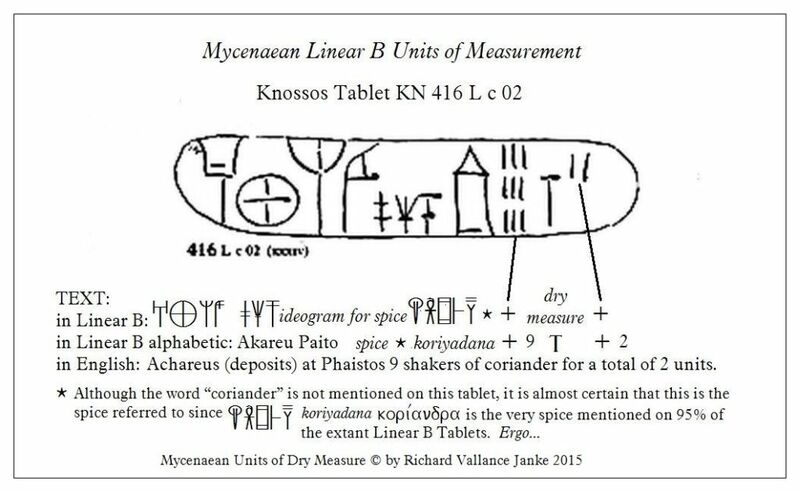 We then introduce the newly minted term in Mycenaean Linear B, the supersyllabogram, being the first syllabogram or first syllable of any word or entire phrase in Linear B. Supersyllabograms have been erroneously referred to as “adjuncts” in previous linguistic research into Mycenaean Linear B. This article demonstrates that their functionality significantly exceeds such limitations, and that the supersyllabogram must be fully accounted for as a unique and discrete phenomenon without which any approach to the interpretation of the Linear B syllabary is at best incomplete, and at worse, severely handicapped. Just added to my academia.edu: Did you know you speak Mycenaean Greek? You do! An amusing read too! To my utter astonishment, in the first two weeks alone I have been present on academia.edu, my little research corner has already been visited 552 times, and I now have 75 followers. I would be delighted if you were to follow me on academia.edu, and if you yourself are already a member, please be sure to send me a message on site, and I shall follow you back. This is the first of a series of several papers I shall be publishing this year and next (2016) on my hypothesis underpinning the theoretical and proposed actual links between the archaic Greek of Book II of the Iliad by Homer, and in particular of the Catalogue of Ships (lines 459-815). 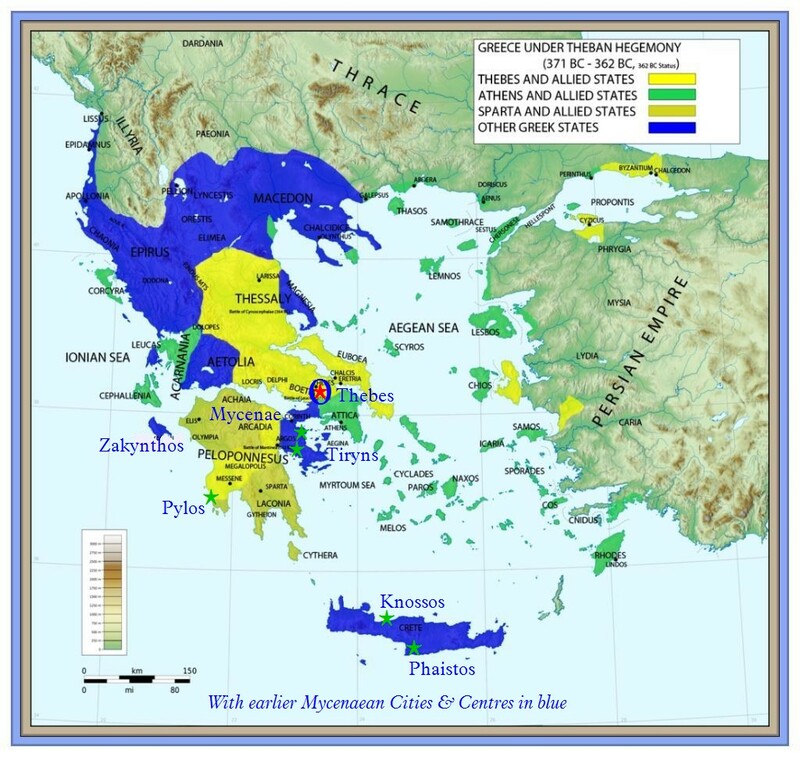 These papers are of extreme significance to the methodology, process and procedure of regressive extrapolation of Mycenaean Greek vocabulary or grammatical constructs derived from the most archaic Greek in the Iliad, considered by many researchers to be an in)direct offshoot of Mycenaean Greek itself. Vocabulary or grammatical constructs thus derived are then progressively applied to reconstruct parallel elements missing from any attested Linear B sources regardless. I cannot stress too much the extreme significance of this particular line of research I am pursuing in the reconstruction of numerous elements (possibly even into the hundreds) of Mycenaean Greek derived from these sections alone of the Iliad. UD: The Real Problems with Gretchen E. Leonhardt’s Commentary on the Rôle of the Syllabogram WE in Linear B as Representative of the final “s” or sigma stem in Mycenaean Greek. Many Mycenaean Linear B [words] ending with “WE” indicate that “WE” as the last syllable of such Mycenaean words is actually the consonant “S”. Unfortunately, at the time of that post, I entirely neglected to credit Ms. Leonhardt for her professed “discovery” that the syllabogram WE in the ultimate position in Mycenaean Linear B words can and often does exactly correspond with a final sigma or “s” stem. I hereby correct my oversight. Now this I believe to be a significant contribution to our ongoing understanding of the phonetic values of syllabograms in Mycenaean Linear B, in this particular instance of the possible of the final sigma stem to the syllabogram WE in the ultimate. But I am obliged to set the record straight, reserving full copyright to Ms. Leonhardt on this account, with the strict provisos I underline below. These Linear B pairs suggest that the inclusion of the final consonant sigma without a vowel nucleus was either a later or a contemporaneous dialectical development. ... except that even with these changes, the statement is still unclear and quite misleading. (b) If Ms. Leonhardt means to say that this phenomenon was a later development (in Mycenaean Greek), this presupposes that in early Mycenaean Greek the inclusion of the final consonant sigma without a vowel nucleus did not in fact exist, and that the only phonetic attribution that could have been assigned to the syllabogram WE in early Mycenaean was, quite simply, WE. that the evolution of the early Mycenaean phonetic value of WE as itself and nothing more than that into WE + ultimate sigma as consonant stem was in fact contemporaneous with the appearance of the latter in later Mycenaean Greek. But this constitutes a flat-out contradiction in terms. Either WE always stood for WE + ultimate sigma as consonant stem from the very beginning of Mycenaean Greek in Linear B, or it never did. You cannot have it both ways. Languages do not fundamentally and arbitrarily change the principle(s) upon which word stems are formed in mid-stream. Languages simply do not arbitrarily change any of their grammatical underpinnings in mid-stream, without becoming another, entirely new language. This is the case with ancient Greek versus modern Greek. Modern Greek is a different and entirely new linguistic phenomenon, in other words, a new language, simply because it has fundamentally re-written wholesale so many of the grammatical principles underlying it, abandoning lock-stock-and-barrel huge chunks of the linguistic structural foundation(s) of ancient Greek. For instance, there are no infinitives as such in modern Greek. That is one huge departure from ancient Greek. I am certain that Ms. Leonhardt certainly surely did not mean to imply anything like this, but her statement is so unclear that it begs the issue. This is precisely why I always spell out any observation whatsoever I make on Linear B down to the very last detail – even it entails repetition – because I must be certain that I have clearly and unequivocally made myself clear to my readers, most of whom are not familiar with Linear B at all, let alone with the notion of a syllabary. (d)... and that is precisely where Ms. Leonhardt’s all too brief and all too terse statement falls flat on its face. She unfailingly assumes that her readers are familiar – even intimately so – with the concept of a syllabary. But if the majority of her readers do not know what a syllabary is (and we can be quite sure they do not), then how on earth she expects them to be familiar with the very arcane Minoan Linear A, the complex syllabary, Mycenaean Linear B, or with the slightly less arcane Arcade-Cypriot Linear C simply stumps me. Such an assumption leaves her wide open to misunderstanding, misinterpretation, if not complete bafflement, on the part of her readers, the majority whom are not even necessarily versed in linguistics. In fact, even among linguistics who are profoundly versed in Minoan Linear & Mycenaean Linear B, there are are almost none who have any understanding of Cypro-Minoan Linear C, by far the easiest of the three syllabaries to master. Apart from the Egyptologist, Samuel Birch, who, with the assistant of other researchers, deciphered Arcado-Cypriot Linear C in the first place in the 1870s, very few linguists these days can even read Linear C, apart from Ms. Leonhardt and myself. Summa in veritate, who says they should? Certainly not I. Yes, even we linguists have plenty to learn from one another. I for one am still struggling to unravel the the subtle niceties of both Mycenaean Linear B and Arcado-Cypriot Linear C. I have a long long road ahead of me just trying to cope with these two syllabaries, let alone any other! e) She then rounds up her observations on the syllabogram WE by noting (correctly) that “As for /we/ in the initial and medial positions, the tentative conclusion is that /we/ shifts to /e/” (My apologies for being unable to reproduce epsilon in the body of my post). The problem here is that /we/ does not shift at all, because it never did in the first place. WE is WE is WE. A rose is a rose is a rose. (f) All of my observations above are absolutely critical to a clear-cut understanding the actual rôle the syllabogram WE plays in the ultimate in Mycenaean Linear B as merely an indicator of the unseen presence of a final “s” or sigma stem. I say, “unseen” or invisible, because – and I repeat - WE in Mycenaean Greek is just that WE, i.e. digamma followed by the vowel epsilon or eita ... and nothing else. Since Linear B, being an open-ended vowel-based syllabary, forbids the presence of a consonant in the ultimate of any syllabogram, and more to the point, since no-one in any language ever pronounces the ultima word stem alone without the addition of a proper inflection (verb conjugation or nominal/adjectival declension), the whole argument implodes on itself. So while Ms. Leonhardt most assuredly holds the copyright on her own professed theory that the syllabogram WE in the ultimate is the exact equivalent of final “s” or sigma indicating the stem of the word in question, for all of the reasons I have cited above, I simply cannot agree with her hypothesis. My counter-hypothesis, which I shall presently post in great detail, is firmly and roundly based on my regressive-progressive extrapolation of the declension of all nouns in adjectives in the Athematic Third Declension of Mycenaean Linear B I have just posted on our blog. My extrapolated declension of such adjectives and nouns makes it perfectly clear that, even if the syllabograms WE, as well as – I must also add - WA in the ultimate, might both be indicators of the presence of a final “s” or sigma stem pronounced in spoken Mycenaean Greek, this does not mean that WA & WE actually contain within themselves this putatively pronounced final “s” or sigma, simply because they cannot. In fact, the syllabogram WE in the ultimate position in the dative/locative/instrumental singular presupposes the total absence of any final “s” or sigma stem, clearly marking instead the actual presence of an ultimate “i”, the tell-tale indicator of that (those) case(s). 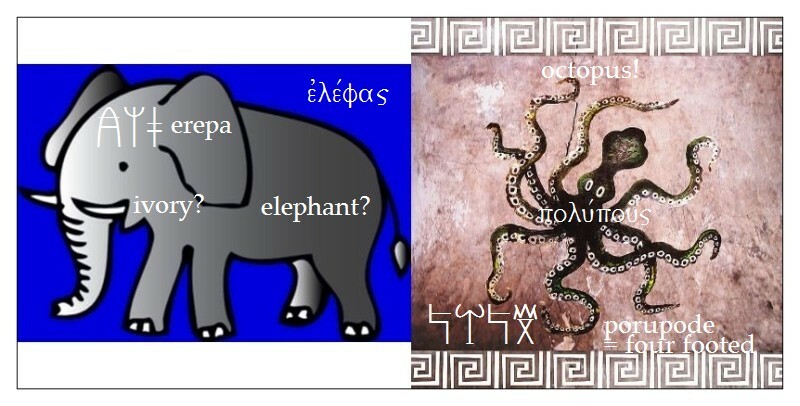 The ultimate “i” in the dative/locative/instrumental was always present in archaic Greek dialects, and subscripted into the iota subscript much later in ancient Greek, as in the Attic dialect. In other words, my own hypothesis of the actual rôle of ultimate WA & WE in Mycenaean Linear B is at marked variance with that of Ms. Leonhardt on the same issue.